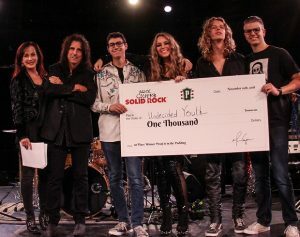 Musicians – would you like to open for Rock and Roll Hall of Famer Alice Cooper and win $1,000.00 CASH? Proof Is in the Pudding is the ultimate music competition that brings together over 300 musicians ages 25 and under to compete for 100 plus prizes. Produced by Alice Cooper’s Solid Rock, the winning band and the winning solo artist will get to open for Alice Cooper at Christmas Pudding at the iconic Celebrity Theatre. Plus, the winning band will get $1,000.00 cash and the winning solo artist will win $500.00! Proof Is in the Pudding’s FIRST winner was Jordin Sparks before moving on to win American Idol. Many participants have moved on to try out for American Idol and The Voice along with receiving opportunities to open for Jonny Lang, Social Distortion, ZZ Top, P.O.D., Jackson Browne, Chevelle, Colt Ford, Mandy Harvey and countless other national acts – all by being a part of this amazing music community. Proof Is in the Pudding Kick-off begins on September 27th, 2019 at Alice Cooper’s The Rock Teen Center. All music genres encouraged! Everyone is encouraged to invite family and friends to all performance dates starting with Round 1.